The acclaim for Uwe Rosenberg’s recently released Caverna: The Cave Farmers interests me. It’s a very conservative design, from an increasingly conservative designer. It offers very little innovation, but the cult of the new have fallen hard for it (with Tom Vasel vocally proclaiming that it has displaced Rosenberg’s 2008 megahit Agricola in his collection). The relationship with Agricola is a deep one, so it is understandable that Vasel should talk about Caverna as a replacement for that game. When word of Caverna first emerged, back in 2010, it was known as Agricola: The Cave Farmers, and the moniker Agricola 2.0 has stuck to the game since. Caverna adds mining for ore and rubies to the farmyard management of Agricola in a way which is thematically peculiar, but mechanically unspectacular: ore and rubies can each be collected through ordinary worker placement (i.e. 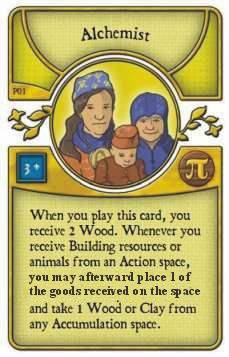 place the worker, take the item), much like any resource could in Agricola (be that resource a building material, a crop, or livestock). Building mines can mean collecting more ore or rubies from the action spaces in question, but, ultimately, little distinguishes either from, say, stone, or other resources which had existed in Agricola. The bigger change Caverna makes is in swelling elements which already existed in Agricola, and bundling multiple actions on a single space to create abundance. A clear example of this is that fencing a space, collecting animals and building a stable would take three separate actions in Agricola, but can all be achieved through one space in Caverna. Everything else in Caverna is scaled up accordingly. Where each player board in Agricola has 15 spaces, each board in Caverna has 24. Filling the extra space is no harder than filling up one’s smaller farm in Agricola, however, given how much more each Caverna worker can accomplish. 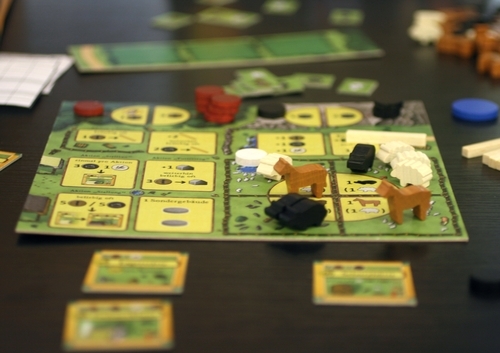 Harvests – during which family members must be fed – come more rapidly in Caverna than Agricola. Again, however, feeding in Caverna is no more challenging than it is in Agricola (indeed, it’s commonly felt to be easier). 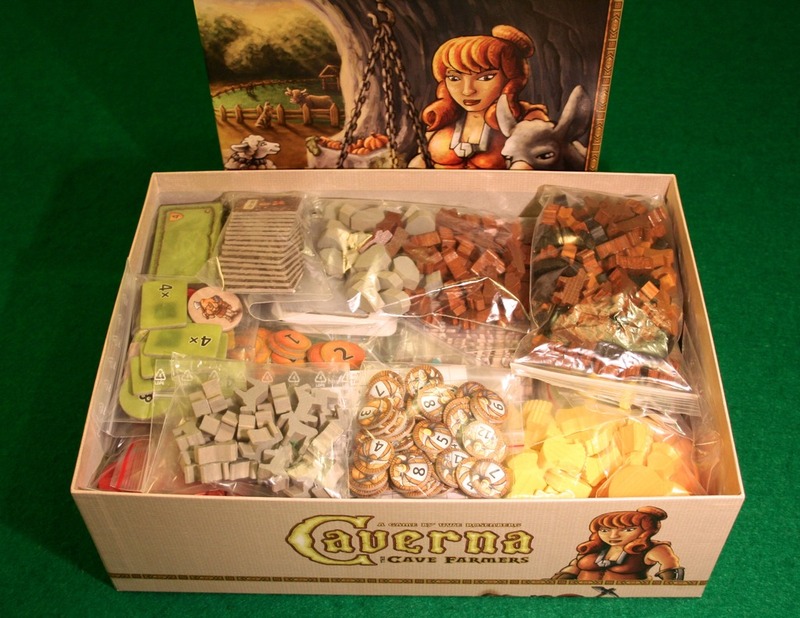 Caverna has five kinds of animal to the three in Agricola. In effect, Caverna can be said to come from the school of thought which sees Monopoly: The Mega Edition or MEGAcquire as useful items. Everything is bigger (even the box) for the sake of being bigger. I’ve only played Caverna once, and I don’t offer this as a review of the game. In honesty, I enjoyed the experience, though I found the array of rooms I could build bewildering. It’s more an expression of confusion that anyone, particularly anyone who owns Agricola (or has access to it), should feel the need for Caverna. I can understand why some might find its changes positive, but I can’t understand why the relatively limited adjustments should be considered worth the investment Caverna requires (both financially, and in terms of the time required to adjust to its slightly altered engine). Caverna is, ultimately, little more than Agricola slightly zoomed out: each action feels bigger, but only because the scale of the composition is different. 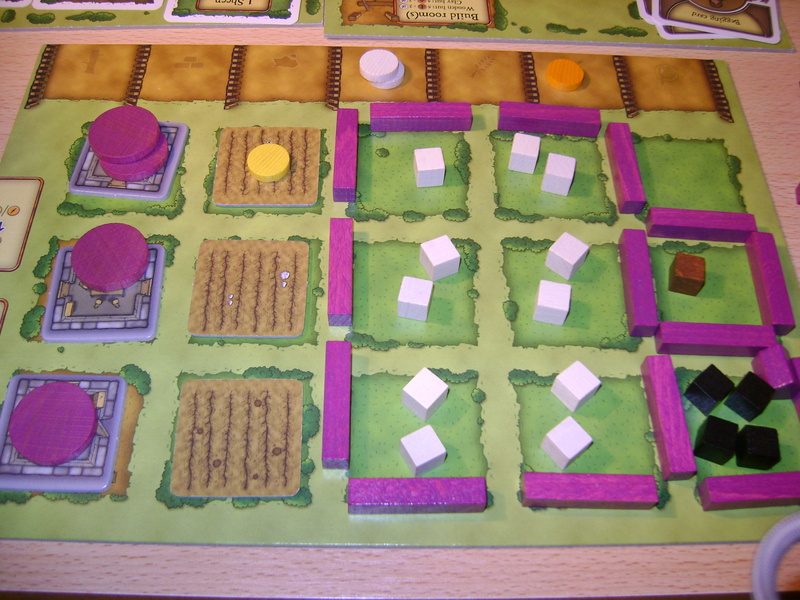 That your farm board has more spaces doesn’t really mean you can achieve more – it means that everything on it is slightly less valuable relative to its Agricola counterpart (just as each point is less valuable, because more are available). In a sense, Caverna offers the board game equivalent of the reskin of the latest iOS. It provides changes hard to define as improvements, changes which seem to exist simply to expose the previous generation as old (until the launch of iOS 7, my first generation iPod Touch, which is still ticking along, was basically indiscernible from a more recent product). Of course, some will prefer Caverna to Agricola, just as some will prefer a gold iPhone to a black one. Don’t think of Agricola 2.0 as an upgrade, however. Indeed, if you have and enjoy Agricola, probably best not to think of Caverna very much at all. Why focus on the game you don’t have? After all, expanding the scale of a game doesn’t mean expanding the fun. 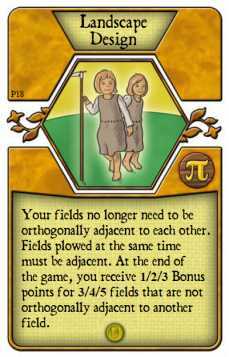 The Agricola π deck, a mini-expansion composed of 12 occupation and 12 minor improvement cards, was released at Essen this year. When the deck appeared in the Board Game Geek store earlier this month, I decided to take a chance on it. I’m no completist, and do not have any other Agricola expansion decks, but a promo can offer a neat way to dabble with something new. I was not entirely sure what to expect. 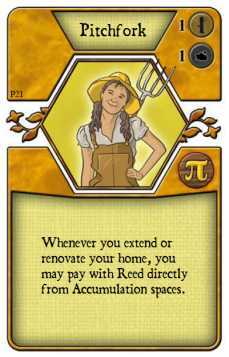 The artwork on the cards of the π deck suggests it constitutes a toy primarily for the Play Agricola community who designed its cards: the illustrations, even those for minor improvements, feature portraits of the designers, as well as their friends and relatives. 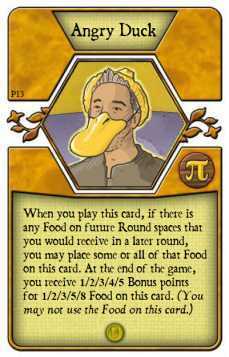 In particular, Angry Duck and Retirement appear to constitute in-jokes from which the player not involved with Play Agricola cannot help but feel excluded. Likewise, the family portraits on the Alchemist and the Fertility Shrine are alienating. Anyway, on Friday my order turned up in the post, and on Saturday I had my first chance to play with the new cards, using them in two three-player games. 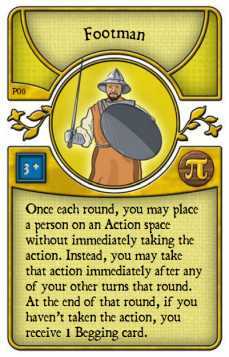 In the first of those we used six of the seven occupations in the π deck suitable for play with three or less (the remaining one, the Altruist, looked as if it would demand very unorthodox play from its possessor, and therefore we opted not to include it in this instance). 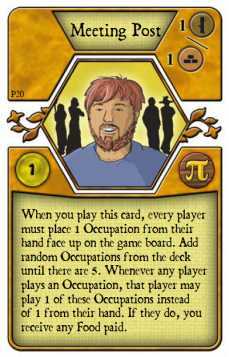 We dealt two of these occupations to each player, along with two new minor improvements each. The remainder of cards were a mix of the standard E, I and K decks. In the second game, we played with occupations from the base game, together with the remaining six new minor improvements, again giving two to each player. The first game offered me the Alchemist and the Chisel Maker, along with the Meeting Post and the Fertility Shrine. None of these seemed to constitute a card around which I could build a strategy, nor did any of these cards particularly contribute to creating a killer combination in this instance. In a sense, I was pleased that this was the case. Expansion elements which make themselves heard by overpowering elements of the base game may speak loudly, but seldom sweetly. In the end, the only occupation I played was the Schnaps Distiller from the K deck. I did, however, play the Meeting Post early in the game. Though I partly played it for a cheap victory point (one wood for one point), the public pool of occupations which the card opens up contributed a fair amount to my enjoyment of this particular game. One opponent kept voicing a desire to recruit the Seed Seller which the other had contributed to the pool. Was it bluff, or was it sincere? It didn’t seem to suit his strategy this game. Would there be any compelling reason to nab the card myself? I decided against doing so, and so did my opponent. However, even though the occupation pool had had little direct impact upon the outcome of this particular game, it stimulated a more dynamic, nuanced form of interaction than Agricola normally musters. As it transpired, only one new occupation was played by any of us: the Footman. Its power to reserve spaces in order to activate them later was, however, never used too speculatively – largely to grab sowing spaces before having a crop to sow. 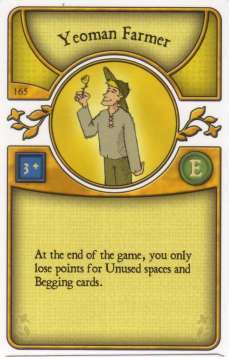 However, the possessor of the Footman – the eventual winner of the game – suggests even using the card in this way made him tense. In the second game, I received the Pitchfork and the Shelter in the Field. The Pitchfork seemed tempting, if only for the amount of actions it might provoke my opponents to spend in blocking the reed space. The Shelter in the Field, by contrast, felt more like part of a potential Plan B than a card I would begin the game intending to use. Neither, however, turned out to be part of my game this time. I certainly didn’t need a back-up plan: the gambit of collecting an early fireplace paid off with a handsome meal of sheep, this providing me with a base from which to build a lead over my opponents which was never bridged. However, Spars and the Gardener’s Bothy did see successful play by my respective opponents, one of whom also enjoyed building a diamond of fields to satisfy the Landscape Design improvement, even if the point yield of doing so was low. 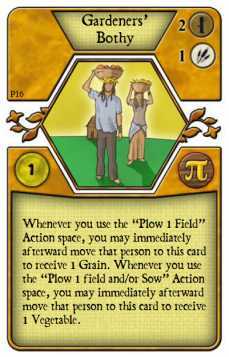 It, like many other cards in this deck, offered a side quest to pursue which added to the regular Agricola experience, rather than diluting it. A couple of cards are too situational to imagine they’ll see a great deal of play, but nonetheless the π deck is made up of cards I’m happy to mix in with the others I own, and which I look forward to investigating further. I play regular Agricola a lot with two; the key elements which make the game as good as it is are all in place in one-one-one play. 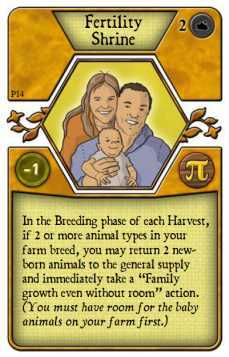 The pleasure in seeing your farm develop, and the potential for improvement and occupation cards to power novel play are undiminished in this format. What is more, the stress of second-guessing which action spaces might appeal to a single opponent is, in some senses, sharper than the possible tension with more players involved: with more players, one is pushed to be opportunistic – grabbing a big haul of resources whenever possible, aware one opponent or another would almost certainly use the action space in question otherwise. Working out who exactly is seldom a credible prospect, and often would not be worth the effort if it were. With two, by contrast, it is both more feasible, and more necessary, to attempt to read your opponent’s needs. It might be possible, say, to leave a large pile of wood to collect next turn, if there is evidence your opponent sees a more pressing need to collect sheep. The fact that there is no means to acquire stone before round five at the earliest – that is, without the possible assistance of occupations or minor improvements – does make the two-player experience distinct. In that both ovens require stone, this particularly affects the viability of strategies based on baking bread. Perhaps this means a hand of cards oriented towards building and using ovens is tougher to work with in two-player. That’s not really been my own experience, however. Anyway, with all this in mind, I hadn’t been falling over myself to try Agricola: All Creatures Big and Small, the two-player only iteration of Agricola released earlier this year. However, a friend has been good enough to lend me a copy. I’ve played four times over the past couple of weeks. I’d usually be keen to play more before attempting to put a review together, but I can’t keep the game forever. The first thing to get out of the way is that the name clangs. It’s irksome to be pushed into mangling the phrase ‘All Creatures Great and Small’ in order to speak of this game. It suggests a lack of attention to detail, and, a lack of aesthetic sensibility. The responsibility lies, I assume, with translator Patrick Korner, rather than designer Uwe Rosenberg, but it is nevertheless to the detriment of Z-Man Games’ English language edition of the game that it should make the awkward first impression it does. That gripe expressed, it would also be remiss not to mention the seeming cynicism in the recent release of the More Buildings Big and Small expansion, only six months after the base game. Composed of 27 new special building tiles – four of which are to be drawn randomly to be used in any given game, it constitutes the only official means to inject variability into the game. It is hard to imagine these tiles (which retail for a frankly indecent RRP of £12 in the UK) had not been devised at the time the base game was released, and could not have been included with it for a modest increase in price. I haven’t had a chance to play with More Buildings Big and Small, and therefore won’t be reviewing it here, but I do feel compelled to express the dismay its release arouses in me. In itself, though, Agricola: All Creatures Big and Small does much to please and little to offend. A game consumes roughly half the amount of time a two-player game of standard Agricola takes, making playing on a weekday evening a more comfortable possibility. The inclusion of animeeples as standard also makes it that little sweeter on the surface than its big brother. 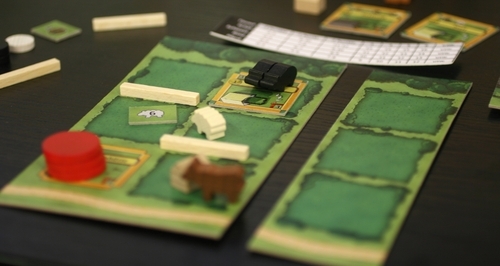 All Creatures Big and Small essentially condenses the Agricola experience into one of animal rearing and rustling. There are no crops, there’s no family growth, and there’s no need to feed one’s workers. It’s just a matter of yoinking sheep, cows, horses and pigs from the wild, and using resources to fence pastures and build stalls and stables: these can all become crowded to indecent extremes – up to ten horses could live in one small stable, if it has a drinking trough in place. The resulting process of stacking little wooden horses on top of little wooden horses offers a fun distraction as a dexterity game, though it does sit at odds with the fluffy, family-fun feel of the game at large (cardboard multiplier tokens can substitute for large numbers of animals, though this is something of a cop-out, and doesn’t really remove the feel that animals are being kept in less than savoury conditions). There’s also no individual hand of cards in All Creatures Big and Small. All options are equally open to both players, and no information is hidden. The result, I’ve found, is that certain key decisions can be much tougher to make in All Creatures Big and Small than any given decision in regular Agricola might be. 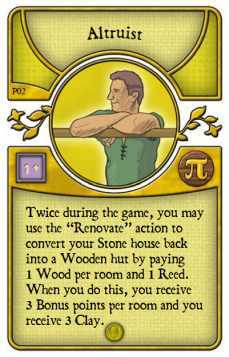 Reasoning between taking a clutch of wood or of stone, one might let one’s cards steer the decision in standard Agricola, but here that isn’t an option. The impact of a given decision is more calculable, meaning there’s more potential to be lost in thought. Things are over more quickly because there are less turns in a game, but do not expect to be substantially less taxed in that time. I do not feel well placed to make assertions about how similar one game of All Creatures Big and Small will eventually start to feel to the next. In my four games, I’ve ended up a couple of times with my animals spread across large pastures, a couple of times with them cramped in overcrowded stalls and stables. 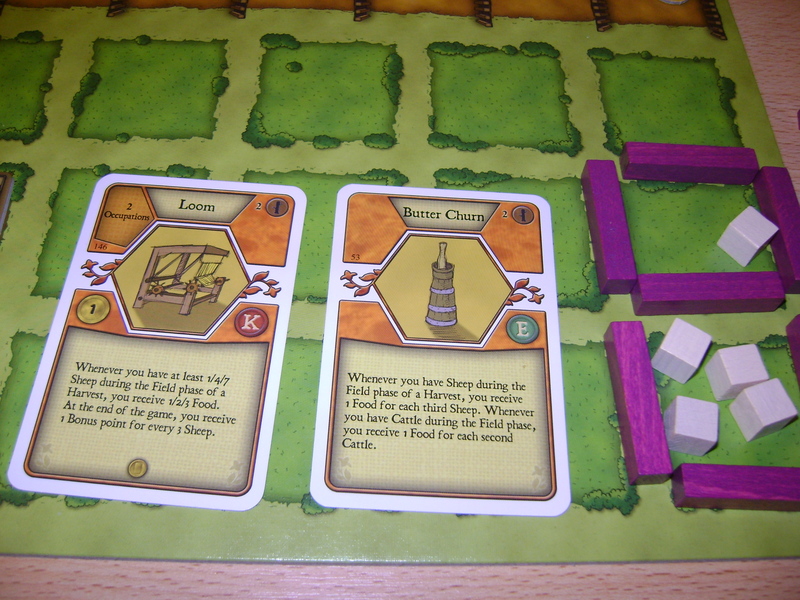 These, I guess, will be the major flavours of experience the game provides – a dense, stall-oriented farm, or a more open, pasture-oriented farm. None of the four special buildings included with the base game (all of which are on offer every game, from the beginning) feels as though it would have a major role in shaping the taste of a particular game. The storehouse – which gives victory points for resources possessed at the end of the game – is the most particular, and could theoretically be the engine of an extreme strategy, but it is hard to imagine that one could overcome giving one’s opponent the chance to collect a significantly higher amount of animals. Nevertheless, because fences are relatively costly, it seems to be seldom an option to build a large amount at once, meaning they tend to be built in ad hoc arrangements to meet immediate needs. At this stage, it does not seem that standard maximally efficient layouts could plausibly come to dominate play, given that allowing the time to let resources accrue would mean failing to address short-term needs. Thus, All Creatures Big and Small provides tough decisions turn-by-turn, but in a smaller strategic space than that of regular Agricola. In that it’s a more comfortable fit for an evening, there is justifiable reason for a person who owns and enjoys standard Agricola to also own this, even considering how well the original game works with two. To add in the new building expansion would take All Creatures Big and Small close to the price of the eminently heftier original game, which would rankle, but would probably be worthwhile to give the condensed iteration legs. However, I’m not personally planning to buy All Creatures Big and Small having had the chance to try it – much though I’ve enjoyed experimenting with it. As it stands, I typically play regular Agricola a couple of times a month, and that’s probably enough of the system for me. In trade, or on special offer it could yet tempt me. On a game-by-game level I’m choosy about reading strategy articles. For about half of the games I play regularly, I avoid reading anything of this kind. I know there to have been plenty written about how to succeed at Race for the Galaxy, but I want to learn about its card combinations and hand management strategies for myself. On the other hand, there are games I want to play to the highest standard I possibly can, and that inevitably means standing on the shoulders of others to do so – using their wisdom, and advancing from it. I think each approach has value, and there are enough games I have a chance to play regularly that I can utilize each. Agricola is one game I wish to play at a serious level. However, there is a curious absence in strategy articles with respect to it: the way in which certain decisions either increase or reduce the space in which a player can perform (both in the sense of possible in-game actions available to perform, and in the sense of the range of table talk and body language a player can use to manipulate his or her opponents). Playing a card from hand is necessary to gain its benefit – but there has been little comment on how this action also has a cost in terms of exposing a player’s goals. This may be true with respect to strategy articles about other games too. 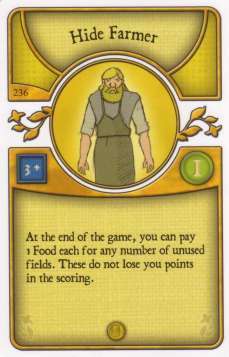 It is simple to calculate how much food, say, the Berry Picker has granted a player in a particular game of Agricola. Or how much use a particular building in Caylus attracts, and how much direct reward it grants its owner. It is, by extension, relatively simple to calculate how much food, on average, the Berry Picker gives in different games with different numbers of players. One could then rank the cards on broadly this basis – as I believe has happened. Working out what options a move denies a player is an entirely more complex business. This side of the equation is, I think, very much under-considered. But, while it may be essentially impossible to trace, that does not mean it should be ignored, with respect to Agricola or any other game. 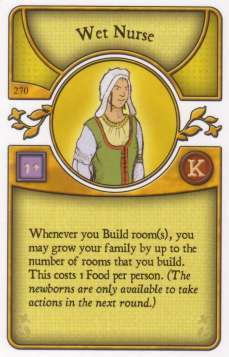 In Agricola, the three most revered cards tend to be the occupations Taster, Lover and Wet Nurse. The latter two in particular must be played early to be valuable. Because of this, they quickly limit a player’s flexibility. I will not argue that these occupations are not strong. The Taster is particularly powerful. In that it lets a player jump ahead in the turn order with his or her first worker for a small payment of food, It takes much of its potency from the fact it is essentially unblockable; there is no means by which its owner can be prevented from having first choice of action whenever he or she values this sufficiently to pay for it. The other two are also potent, but do leave more opportunity for opponents to counter them. The Lover costs a not inconsiderable four food to play, but allows its possessor to immediately claim a new family member, even without space in his or her farm. 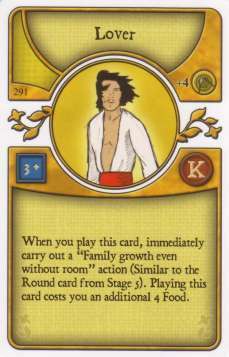 The card is valued for allowing very early family growth, giving the person who played it an advantage in actions through the opening stages of the game. But, in that so much food must be spent by the player in question, his or her survival at the next harvest can be dicey, and can be made punitively taxing with a little targeted play. The Wet Nurse, meanwhile, allows a player to expand his or her family at the same time as expanding his or her house (thus saving actions and sparing the need to compete for the highly-contested family growth action space). It too tends to be of the greatest utility earlier in the game – therefore exposing the individual who played the card. If he or she does advance through this gambit, the gains are clear to all other players. In short a card which must be revealed early to be of value stands to be as much a curse as it is a blessing. What then, to make of a card like the Hide Farmer? Its power is solely connected with end-of-game scoring; it allows a player to pay one food per unused space in his or farm in order to prevent these spaces attracting the minus points they would normally. 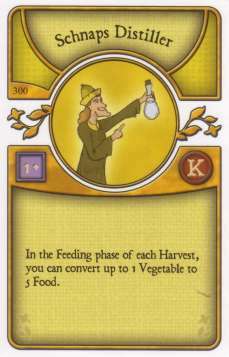 Now deceased Agricola card reviewing site, Agricola DEconSTRUCTED (I don’t get the point of the eccentric capitalization), suggested that ‘converting food on 1:1 basis for VP is awesome,’ heralding this aspect of the card, but then it ultimately awards the card a mark of 4/10. This, I think, rather misses the point. 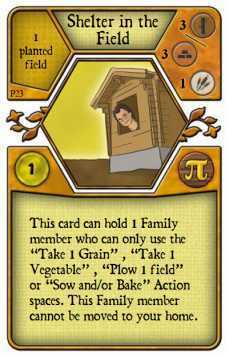 The Hide Farmer allows a player to intentionally leave unused spaces on his or her farm, knowing they needn’t yield negative points. It oughtn’t, ideally, to be used to mop up the results of sloppy play, but to liberate a player to pursue an extreme strategy. I can largely avoid the ever-fraught contests to collect wood for fences, and invest more in potentially lucrative (and useful) major or minor improvements. What is more, I can, with the right gloss and demeanour, do this without looking to my opponents like too serious a threat. An opponent familiar with the card manifest might have suspicions, but, I would say, these could usually be defused. And then, one finds oneself able to pursue one’s direction, the victim of little or no intentional obstruction. Being able to hide one’s success is difficult to value in concrete terms – which is why I believe it to be undervalued, in this game and in others. In this case, it might mean that opponents let that bit more stone stack up before swooping, choosing instead an option that hurts a more openly successful player. One’s neighbour to the right might be that bit more ready to play a minor improvemment which has to be passed on to me. I might not be blocked so readily from becoming starting player. The same is also true of the Yeoman Farmer – which lets a player escape minus points for not accumulating any of a particular crop or animal, and for not building fields or pastures. 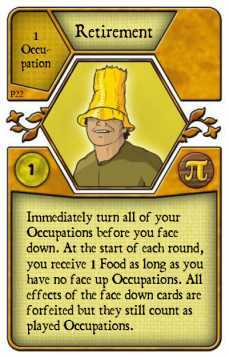 In his card by card review of Agricola‘s occupations, Alex Chen writes that ‘If you’re playing decently, he shouldn’t be worth more than 2 points.’ I guess I must disagree – if you’re playing decently, the Yeoman Farmer will inevitably be worth more than two points (if it weren’t, you most probably wouldn’t even play it from your hand, after all). The card can look poor in terms of the points it directly yields, but in terms of how it may distort an opponent’s perception, its value is potentially considerable, and undoubtedly immeasurable. In a sense, many strategy articles which have been influential seem to lose sight of the fact that they address games which involve multiple players attempting to read and manipulate a system. In short, they mistake the economic structure around which a game rotates for the game itself. Knowing, broadly, the relative worth of wood, reed, stone and clay in Agricola is no small part of knowing what’s going on, but it’s the barest beginning of knowing what really constitutes the game and how to win at it. 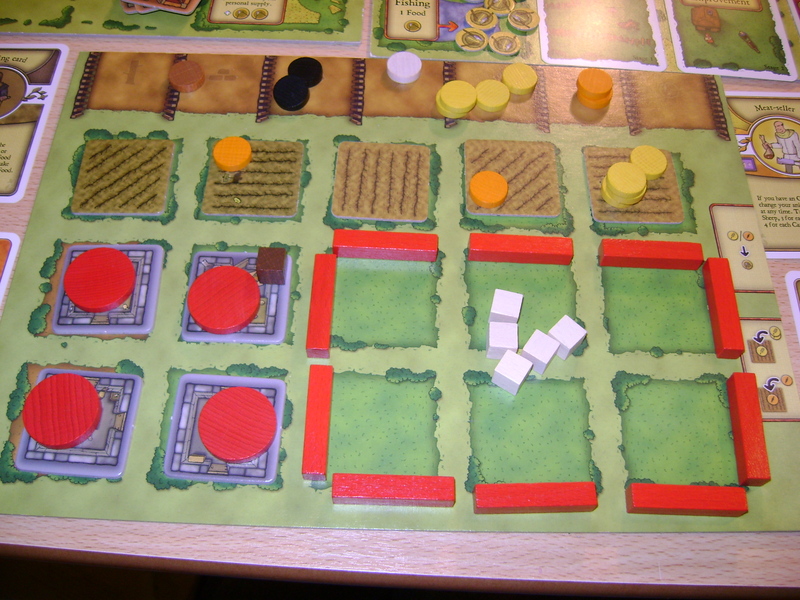 A large part of Agricola exists in distorting what other players perceive to be your needs with respect to each resource, and taking advantage of that distortion. Bulldozer wins – establishing an early lead other players cannot restrain – exist, but are rare. In that most Agricola strategy articles I’ve come across have begun and ended with identifying the perfect storm of cards which might allow this barnstorming approach to succeed, there’s an awful lot of game that’s yet to adequately be covered. 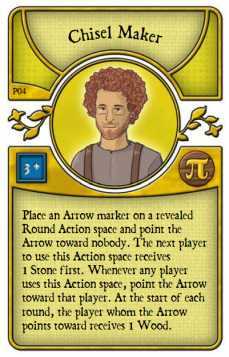 As I realized during a conversation a couple of weeks ago, I can’t ever remember anyone asking to be passed a white cube or a yellow disc during a game of Agricola. Instead, the white cubes are always spoken of as the sheep they represent, the yellow discs as grain. The same is true with respect to the game’s other components and the resources for which they substitute. It’s fair to say the same linguistic immersion does not occur with Caylus. If the present onus is on commentators to address games they play often, take this piece as my flirtation with the spirit of the day. I don’t keep a record, but I’m pretty sure the only game I’ve played more than Agricola is Carcassonne. Not that I buy the suggestion that replayability is the greatest metric for measuring a game’s worth (some fine games are too draining to come back to very frequently, for one thing). But there’s certainly something to explore in a game that withstands multiple plays. Part of the reason why I’ve found that Uwe Rosenburg’s subsistence-farming-based-blockbuster, Agricola, copes with repeated play lies in the immersiveness mentioned, which is a product of the comprehensibility of its resource manipulations. In one sense, there’s a lot to take in (much more than I normally like there to be in a game). But once learnt, the rules are easily remembered: it’s a matter of mapping pre-existing knowledge onto the game’s distillation of it. For instance, grain and vegetables can be eaten uncooked, animals cannot. The amount of grain a player possesses increases when some is sown in a field, while animals multiply periodically if at least two of the same species occupy the same farm. However, the initial collection of resources is through a more abstracted worker placement mechanism. 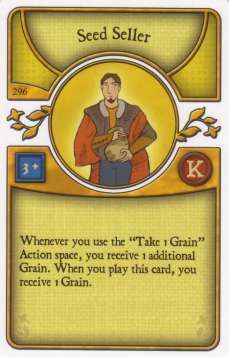 If a player requires grain, he or she places a worker on the ‘Take One Grain’ action space (on a common board – thus blocking other players from taking this space). If wood is required, there’s an action space from which to take that. Resources accumulate on some spaces if they are unused in a round, on others this is not the case. It doesn’t have much to do with a recreation of farming: there’s no money in the game, so this isn’t a market. It could be that these resources are being collected from common land, but, in that case, it’s not obvious why, say, wood should be exhaustible. All of this, I think, hints that the player is to see the real game as that which takes place on his or her own player board, rather than in this communal space. The simulation is, largely, confined to the individual domain. This is not to say that there’s no thought to be applied to placing workers. In particular, timing matters. If you are the only player with either the means to cook animals or somewhere to keep them, you can likely delay collecting sheep – a decision based on a consideration of the condition of your opponents’ farms. In many cases, though, the choice you are faced with will be between resources valuable to all players. A pile of reed, say, or a large haul of wood, ought to be useful to all players, except in very particular circumstances (though, of course, one or other may be more urgently required by one player or another). But, given that obstreperous play can rarely target all other players, the choice whether to take one or the other is, often, primarily based on individual circumstances. It affects the other players, to some degree, but was not predominantly guided by them. Even in a two-player game, aggressive play frequently proves counter-productive. This is because the hand of rule-changing minor improvement and occupation cards each player holds makes any assessment of others’ circumstances an educated guess at best. If, say, an opponent is running low on food before a harvest (when each player has to provide food to his or her workers), it might look like a reliable attack to remove the food built up on the ‘Fishing’ action space. However, it might be that the opponent in question is sitting on an occupation card such as the Mendicant, which can retro-actively wipe-out the minus points incurred in not providing sufficient food. Indeed, cards exist for generating food in all manner of ways. The right combination of cards can mean feeding a family on clay, or wood. A couple of attacks thwarted in these ways, and it’s hard not to orient oneself towards improving one’s on territory – the state of which is reliably calculable (because you know your own cards). Nevertheless, the challenges posed by the occupation and minor improvement cards are often pleasurable. There’s joy in realizing that because you have the Tinsmith occupation you can feed your newborn on clay. It’s fun using the Animal Tamer to fill one’s house with a menagerie of animals. And it’s very enjoyable indeed to use, say, the Lover to expand one’s family early in the game, and then panic about how to feed everyone. Certain card combinations are, naturally, more powerful than others. 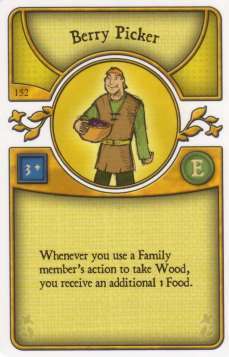 If, say, you have a card that allows you to use wood as food, and a card that provides you with extra wood, that represents the beginnings of a useful machine before the game itself has even begun. However, when cards fall together too well, the tension the game can offer is diminished. If I’m pushed towards a resource others are pushed away from, it can be good for my chances of winning the game, but the lack of competition for the resource I want can make things a bit dull. 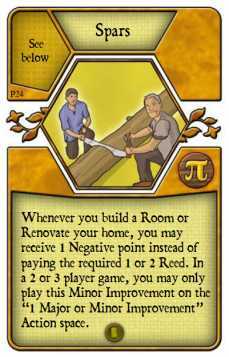 As a result, Agricola either offers the satisfaction of utilizing a neat combination, or the tension of scrabbling to improvise survival. 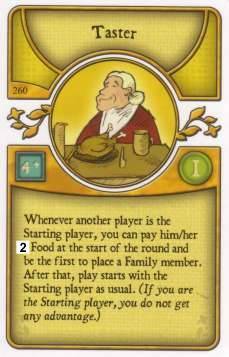 It’s rare that both will come together (though setting up a card-driven food-machine can take a number of actions, a player starts with almost enough food to survive, roughly, the first third of the game – meaning there is time to get cards into play). But, for me, it’s not knowing which flavour of experience a particular game will give which makes Agricola compelling to revisit. It’s not just a question of what food sources my cards help me to exploit, it’s a question whether my cards will really help me at all. 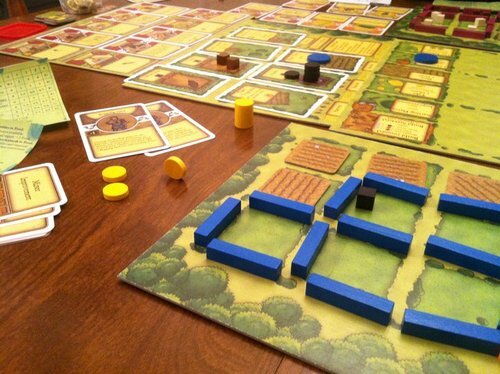 It’s a shame, perhaps, my experience of Agricola is all about what is happening in my domain – my opponents’ spaces being of limited relevance to me – but at least I can believe in my space as the farm it is meant to be.